The journal Ad Age ranked Dove’s “Campaign for Real Beauty” as the number one most influential advertisement campaign of our century. The panel of judges describe it as “groundbreaking, brave, bold, insightful, transparent and authentic” (Neff). The campaign’s purpose is not only to sell personal care products but also to try and change societal notions about beauty. As explained by Ad Age, the idea originated in 2003 in the United Kingdom and Canada, when those responsible for the brand Dove decided to launch a series of billboard advertisements featuring regular women instead of professional models. These billboards asked motorists to vote whether the women pictured were, for example, “fat or fit” or “withered or wonderful.” [Insert Alvarez 1]. 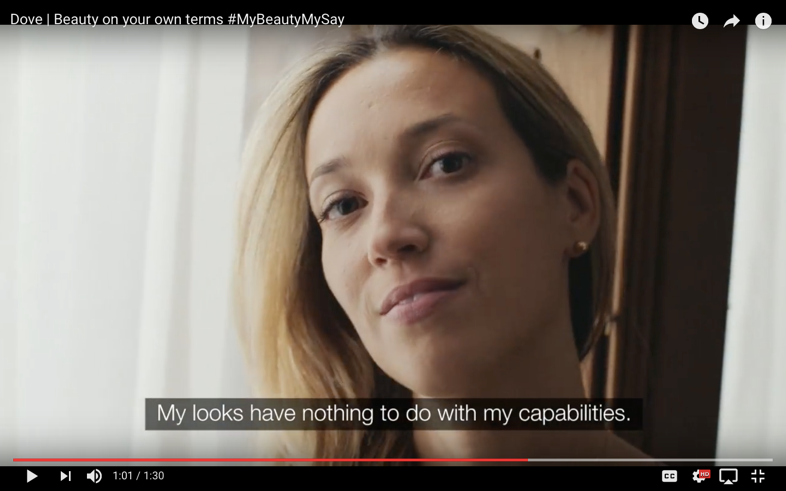 The results sparked a conversation about society’s beauty standards for women, allowing Dove to refocus their marketing and advertising strategies around the idea of spreading positive messages about women’s natural beauty. The advertisements emphasized the company’s determination to create “a new definition of beauty [that] will free women from self-doubt and encourage them to embrace their real beauty” (Pace 45). This new idea received significant media coverage from multiple talk shows and women’s magazines, generating an estimated media exposure worth 30 times more than the paid-for advertising (Pace 44-45). Figuring they were on to something, Dove decided to delve into television commercials and social media to further expand the campaign. Through these channels, the company was able to build a successful brand identity, create loyalty, and achieve recognition value over the years. It fueled a conversation about changing the stereotypical standards of women’s beauty, which people appreciated. The campaign even influenced other brands such as Nike, CoverGirl, Pantene, and Always to mimic this marketing and advertising approach. This article examines how Dove was able to accomplish all of these aforementioned objectives. To do so, I designed and conducted a case study that addressed ow rhetorical elements surrounding Dove’s commercials and social media play a role in creating the company’s successful campaign. I focused on word choices, pathos, and ethos utilized in creating certain themes for the commercials and social media posts that ultimately helped persuade, motivate, and educate Dove’s audience. I analyzed 160 Instagram posts and Tweets and issued a survey, asking participants to answer a few questions about their history with Dove and their opinions on three commercials. There has already been some research about Dove and its marketing tactics, but the majority of studies focused on advertising and digital media, and the areas surrounding the tools a company like Dove uses, such as commercials and social media. For this reason, I will be further expanding earlier research that directly relates to Dove, and how it uses these specific tools in relation to rhetorical elements. Television advertisements have been around for some time now;. however, recent studies argue that the purpose(s) for commercials have changed over time. Belch, Lutz, and Mackenzie state, “…researchers have proposed that attitude toward the ad, an affective construct representing consumers’ feelings of favorability/unfavourability toward the ad itself, is a mediating influence on brand attitude and purchase intention” (130). In other words, nowadays, companies and brands, through their television advertisements, are not necessarily directly selling a product or service but, instead, focusing on the likability of the ad. According to Rimoldi, this action is taken because “associations with the brand may develop, thereby promoting consumer loyalty” (11). Meaning, that if the targeted audience likes the ad,people will more likely have positive attitudes toward the company or brand and become loyal customers. Dove has demonstrated over the years that its commercials help bring in loyal customers because the consumers like the ads and appreciate the overall message the company is promoting. For example in 2006, Dove released a video called Evolution which is arguably the most impactful one the company has produced and broadcasted to this day (Neff). It featured the practice of photoshopping women’s images, which brought great coverage for Dove on numerous talk shows and other media. The video can be accredited with propelling the “Campaign for Real Beauty” to prominence. As for company sales, they “increased from $2.5 billion to well over $4 billion… And as the campaign has increased its profile once again in recent years with videos such as “Sketches” … the brand has been gaining sales and share in virtually every market and category worldwide” (Neff). In summary, Dove has proven it has mastered the use of commercials which, for the majority, end up going viral with thousands of people sharing them and further spreading the company’s message(s). This success has been made possible mainly through the company’s presence in social media. In today’s world, social media plays a huge role in the success of a company. As Haenlein and Kaplan state, “Frms must be aware that collaborative projects [for example, social networking applications] are trending toward becoming the main source of information for many consumers” (62). This finding indicates that the use of the internet and online communication have changed over time. Before, traditional online communities were exclusive to certain groups, “often [requiring] some level of skills, expertise and interest in technology” (Berki and Jӓkӓlӓ 71). It was basically left to the professional technology savvies to do any online communication. Now, however, the internet serves as a medium for connecting a large number of people with one another to share information as well as their ideas/suggestions. Online communities, especially through social media, are accessible to almost everybody and allow “ordinary” people to meet without the need of face-to-face contact (Berki and Jӓkӓlӓ 73). Social media allows companies and brands to communicate with their customers on a global scale, which through any other means would probably be unrealistic. In addition, the easy or simple use of social media applications have allowed customers of a company or brand to connect with each other as well. Barnes describes this online interaction as “not a solitary activity… [interaction] goes beyond the individual and into the mode of identity and social construction” (234). This allows for a sense of community to be created, in which meaningful interaction can take place. Here, the concept that rhetorical aspects in a community affect activity levels plays a role (Bazerman 309-339). In short, rhetorical elements, such as logos, pathos and ethos, influence the activity that takes place within a community. To make said activity happen, means of communication need to be available for the members of the community. Different social media platforms serve as a way for communication to occur. Relating specifically to Dove, social networking sites, such as Instagram and Twitter, are perfect examples how the company and its customers interact with each other through media. For instance, on Instagram, Dove created the hashtag #MyBeautyMySay while posting pictures of various women and their stories on how they define beauty in their own terms. Followers were then able to comment and share their thoughts on the different portrayals of these women. Readers wrote to Dove directly and to each other, and Dove was able to respond to some of these comments. It is interactions like these that will ensure that meaningful activity takes place among the members of the Dove community, allowing for various connections to be made on a global scale and, therefore, also enabling the continuous spread of the company’s message(s). All of these points lead to my research question: How do the rhetorical elements surrounding Dove’s commercials and social media play a role in creating the company’s successful campaign? To better understand how Dove uses its television advertisements and social media platforms to influence, communicate, and interact with its community, I conducted a thorough analysis of three of the company’s commercials and of 160 social media posts. To do so, I first watched numerous Dove commercials on YouTube and then scrolled through the company’s Instagram and Twitter accounts, getting a feel for the content the brand provided. In doing so, I focused on word choices, pathos, and ethos utilized in creating certain themes for the videos and social media posts that ultimately helped persuade, motivate, and educate Dove’s audience. In these terms, pathos is the emotional appeal to the audience, pertaining mostly to encouragement while ethos represents the ethical appeal to the community’s sense of involvement. I noted the themes most commonly found in the commercials and social media posts, coming up with this observed rhetoric: Promoting Beauty/Strength/Positivity (PBSP), in which Dove helped customers realize their personal beauty potential; Encouraging the Community (EC), which indicated that Dove referred to its customers as a whole or as one entity; Encouraging the Individual (EI), where Dove wrote in a manner that only applied to a certain type of person; Sharing Personal Experiences (SPE), when Dove divulged certain happenings in its customers/supporters lives (with consent granted), allowing other customers to possibly relate to the stories; Selling a Product/Informing about a Product (SPIP), in which Dove promoted a product and/or informed its customers about it; and, finally, Giving Thanks (GT), when Dove thanked customers for their support. Please note that these categories could overlap if one or more appeared in the video or social media post. Moreover, once I had finished designing a coding system, I chose 160 Instagram posts and Tweets to analyze, selecting them based on how recent they were published as well as the number of likes, views, and/or retweets each of them had. I assigned each to the categories mentioned in the previous paragraph and calculated which themes were displayed the most, and which ones were displayed the least. Doing so allowed me to see what Dove finds important to portray to its audience. Furthermore, I also chose three commercials to study. One wasthe viral video that brought Dove’s “Campaign for Real Beauty” to prominence and two were from the most recent years (2016 and 2017).Choosing the commercials allowed for some bias; however, I based my selections on the videos’ significance, and how recent they were broadcasted. I then issued a survey, asking participants to react to these three commercials and analyzed their opinions/feelings toward the videos. Doing so allowed me to examine how they responded to word choices and rhetorical appeals used in the commercials—in other words, the themes displayed. The survey also asked participants to answer questions regarding their background with Dove, so I could understand their level of knowledge with the company’s efforts. The survey was made through SurveyMonkey (see Appendix A) directed at only females (since the campaign mainly targets them) at both my old high school and UCF’s main campus (which allowed for larger age range). I received 15 responses out of the 20 survey requests. Dove displayed a substantial diversity of rhetorical elements in its use of television advertisements and social media sites. Generally, these themes and word choices coincided to generate an overall feeling that portrayed what Dove stands for and hopes to represent through its messages. By analyzing some commercials, survey responses, and social media posts, I was able to discern Dove’s style and tactics and identify what the company feels is important to communicate to its customers/audience. Dove is a brand that celebrates diversity and breaking any ridiculous ideals of beauty that society holds for us. It makes me feel that I, in every way, am able to love myself and treat myself to Dove. Honestly, if I know they stand for something that I believe in, (like empowerment) I’m more motivated to buy it. [The videos] made me feel slightly proud and happy that there’s a company that understands how wrong most places have it, how society has it in telling you exactly how you’re supposed to look and there’s no exception. Makes me hopeful that maybe more industries will be created around the similar mindset. These responses prove Belch, Lutz, and Mackenzie’s theory of attitude toward the ad. Companies, like Dove, are beginning to focus and concentrate on the likability of the ad rather than trying to just sell a product or service. There has been a shift to emphasizing the message and/or purpose of the company in order to produce positive consumer attitudes, so that they may become loyal customers (Rimoldi 11). Again, Dove has achieved great success in this area, especially with the help of social media. Looking at Dove’s social media sites, one can detect many rhetorical elements used in each published post. I chose 160 Instagram posts and Tweets to analyze and then assign to a category based on the themes they were displaying. The results can be found in the table below. After becoming a mother, Heather wanted to get back in shape and decided to take up boxing. She soon started to pursue it professionally – even though she was told she was “too pretty to fight.” These comments only made her more determined as a sportswoman. Today, Heather aims to build a presence for female boxing on sports networks, while proving that the way she looks has nothing to do with her boxing. How do you define beauty on your own terms? #RealBeauty #MyBeautyMySay. 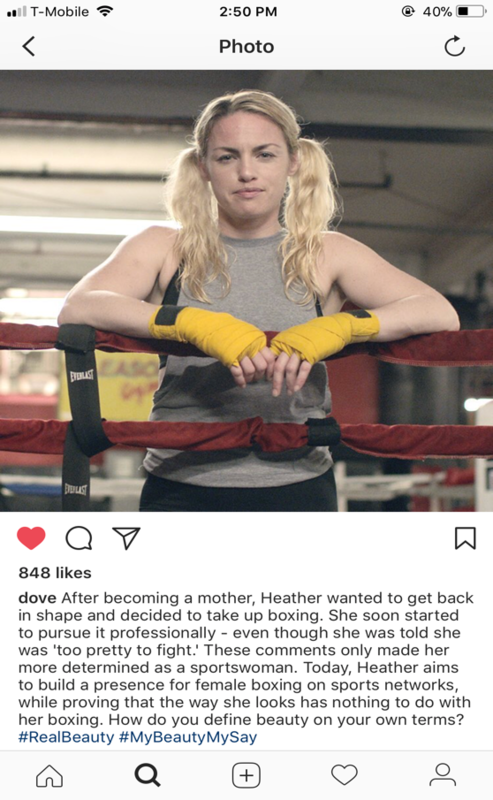 It is clear that this post is conveying the themes of Promoting Beauty/Strength/Positivity (do not give up on dreams), Sharing Personal Experiences (uses Heather and her story as an example), Encouraging the Community (here of female boxers), and Encouraging the Individual (any girl who is struggling with something she is passionate about). These tweets clearly show the themes of Selling a Product/Informing about a Product (Promoting that their products keep people confident with shiny hair and Informing a customer that a specific product is not being made anymore), and Giving Thanks (thanking consumer for his or her support). Furthermore, all of these posts serve as examples to demonstrate how, in today’s world, the majority of people are using social media as their main source for getting information (Haenlein and Kaplan 62). For this reason, companies must make it a priority to keep up with their social media accounts and publish great quality content. If this action is taken, then there is the opportunity for meaningful interaction to take place on a global scale, ensuring the successful spread of the company’s message(s). Overall, the rhetorical elements Dove uses in its television advertisements and in social media are effective. Through commercials and social media posts, the company is able to make small “projects” that contribute to the overall larger purpose/message of the campaign. These tactics are successful and affect the majority of people emotionally and morally, making them feel as if they have a duty to stand with the company and support its efforts. Also, this type of response will encourage them to become loyal customers. It is important to study and research this topic because it constitutes a very powerful position to hold such a huge influence on a large group of people. By understanding what makes a campaign successful, it opens up the possibilities of achieving one’s desired outcome for a goal. However, relating back specifically to Dove, I believe there needs to be more research done. My survey was not as successful as it should have been. I did not reach my goal of at least 20 responses; instead, I only received 15. Additionally, the age range was not as extensive as I would have liked. A future survey would be more effective if there had been a greater variety of ages represented. Also, some of the responses to the question of “How would you participate in the company’s efforts (of spreading positivity dealing with women’s beauty standards)?” seemed alarming. Quite a few people answered that they either did not feel motivated enough to participate or had no clue how to do so. They agreed that Dove did a good job in making its stance clear, and they supported it to a certain degree, but then they felt as if they—as individuals—did not have to join in on the effort. This feedback shows that Dove or other researchers need to find ways on how to better motivate the audience into helping. After all, those people are the ones who are missing out on truly making the largest impact possible for the cause. Barnes, Susan B. Online Connections: Internet Interpersonal Relationships. Hampton, 2001. Bazerman, Charles. “Speech Acts, Genres, and Activity Systems: How Texts Organize Activity and People.” What Writing Does and How It Does It: An Introduction to Analyzing Texts and Textual Practices, 1st ed., edited by Charles Bazerman and Paul Prior, Routledge, 2004, pp. 309-39. Berki, Eleni, and Mikko Jӓkӓlӓ. “Communities, Communication, and Online Identities.” Cyber Behavior: Concepts, Methodologies, Tools, and Applications, 1st ed., edited by Information Resources Management Association, IGI Global, 2013, pp. 71-74. @Dove. “Hi @TaffyTwoShoes. Unfortunately, we don’t carry that product anymore. Feel free to call us at 1-800-671-6025 with any questions. Take care.” Twitter, 8 Feb. 2017, 10:52 a.m.
@Dove. “Thanks for your support, @ashleycarron123. We love to hear that our products are keeping you confident and your hair shiny and full of life.” Twitter, 13 Feb. 2017, 8:53 a.m.
“Dove | Beauty on your own terms #MyBeautyMySay.” YouTube, uploaded by Dove US, 28 June 2016, https://www.youtube.com/watch?v=_XOa7zVqxA4. “Dove: Evolution Of A Model.” YouTube, uploaded by Hilmir, 12 Oct. 2006, https://www.youtube.com/watch?v=s2gD80jv5ZQ. 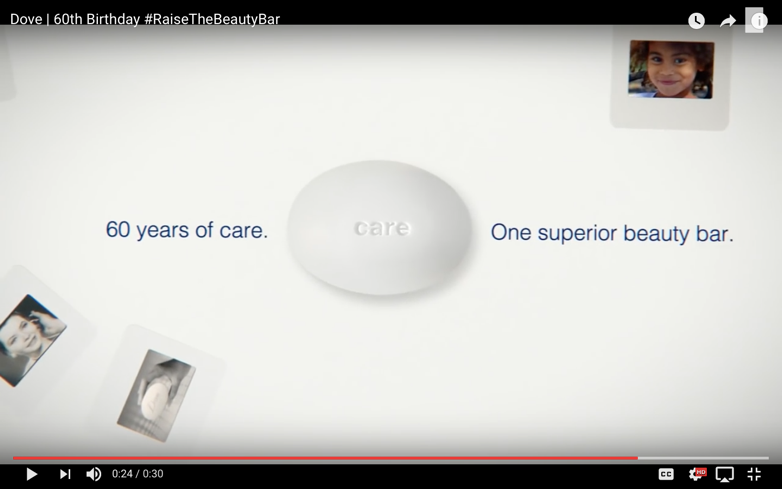 “Dove | 60th Birthday #RaiseTheBeautyBar.” YouTube, uploaded by Skin CR, 10 Jan. 2017, https://www.youtube.com/watch?v=qHIqAnAwcp8. Haenlein, Michael, and Andreas M. Kaplan. “Users of the World, Unite! The Challenges and Opportunities of Social Media.” Business Horizons, vol. 53, no. 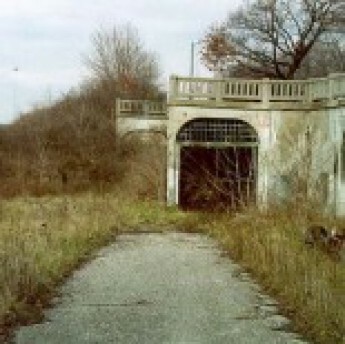 1, January-February 2010, pp. 59-68. MacKenzie, Scott B., et al. “The Role of Attitude toward the Ad as a Mediator of Advertising Effectiveness: A Test of Competing Explanations.” Journal of Marketing Research, vol. 23, no. 2, 1986, pp. 130–143, www.jstor.org/stable/3151660. Neff, Jack. “Top Ad Campaigns of the 21st century; Dove: Campaign for Real Beauty.” Ad Age. Pace, Elizabeth. “Diverse Drives.” The X and Y of Buy: Sell More and Market Better by Knowing How the Sexes Shop, Thomas Nelson, 2009, pp. 44-45. Rimoldi, Oliver. “The impact of ‘likeability’ on advertising effectiveness: To what extent does liking an advert have a persuasive influence on consumer behaviour?” University of Auckland, 2008. Do you use Dove products? If yes, how many and why? If no, then why not? Please watch these 3 short Dove commercials and then proceed to answer the following questions. What is one word you would use to describe the brand after watching the videos? Did the commercials make you want to buy Dove products? Or at least support/like the brand? Why or why not? Did the commercials motivate you to want to participate in the company’s efforts? If yes, then how do you plan to do so? If not, then why not? If you already do so, how do you currently engage in the efforts? After watching the 3 Dove commercials, how do you feel? (Please talk about each video individually and/or your overall feelings toward the company that the commercials may have produced. Some suggested topics to cover: Did you like them or not? Why? What are some themes you noticed in the videos? How did they make you feel? Paulina Alvarez is an undergraduate student at the University of Central Florida, where she is majoring in Advertising and Public Relations and minoring in Digital Media. She wrote this essay during her freshman year. Paulina wishes to continue learning how visual and written components influence human behavior in order to one day create her own effective advertising campaigns as an art director.